To regain a complete, beautiful smile, you are ready to join more than 500,000 people who are choosing to replace their missing teeth with dental implants. You are making a great choice for your oral health and your quality of life. As a long-term solution, dental implants in Belchertown allow you to enjoy the next best thing to your natural teeth. While you are excited to start your journey to a new smile, you have plenty of questions about the procedure and what you can expect. To give you the peace of mind you need to head into the treatment with confidence, here is what you need to know. 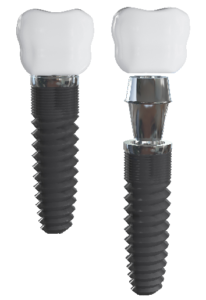 To replace the root of your tooth, a dental implant post will be surgically placed into your jawbone. This creates a secure and stable foundation for your replacement tooth. During the procedure, an anesthetic will be used to ensure a comfortable, pain-free procedure. Your gum tissue will be opened to expose your jawbone and a small hole will be drilled into it. A titanium implant post is then placed, and the gum tissue will be stitched closed. Over the next several weeks, new bone will grow to allow the jawbone to fuse to the post. Immediately following the procedure, it is normal to experience some pain, swelling, and bruising. You can manage your discomfort with pain medications. For a few days, it is best to stick to a soft diet and take the time to keep the surgical site clean. After adequate healing has occurred, you will begin the restoration process. Using a minor surgical procedure, your gum tissue will be opened to expose the implant post. An abutment is then attached to it by your dentist in Belchertown. This is needed to connect a custom-made dental crown. Your gum tissue will seal around the abutment in about two weeks. While you heal, maintain your oral hygiene and avoid anything that may irritate or damage the gum tissue. In some cases, your restoration will be placed the same day as your abutment, while other times, you will need to wait until after your gum tissue has healed. To make your crown, bridge, or denture, impressions of your mouth are taken to design it to meet your exact needs. After your restoration has been placed, you will once again have a healthy, functional smile. In no time at all, it will feel natural, so you can chew, speak, and smile with confidence. During your consultation, your dentist will explain each phase of your treatment and what you can expect. If you still have any questions, take the time to speak with your dentist about your concerns. Dr. Mark D. Medaugh strives to provide the latest innovations in dentistry to help his patient achieve healthy, beautiful smiles. He offers the latest tooth replacement options, including dental implants. If you are ready to replace your missing teeth, contact our office today to schedule your consultation. Dr. M and Pam helped me improve the feel of my gums. I was amazed how better they feel after the scaling and root planing and going on 3 month recall. I bring my kids to the Valley Dentist of Belchertown because the staff is the friendliest ever. The clinical services and attention is even better. Doctor M. spends lots of time with you and pays attention to every question. My kids love to go to the dentist! !